WARNING: This blog post may cause more change in your life. PLEASE don’t stop reading – it’s a BIG ONE and totally worth it. I promise. What do omega-3 and omega-6 have to do with being healthy? Most people are severely out of balance on these two fatty acids, on the heavy-side with one in particular. Remember this: We generally get WAY TOO MUCH OMEGA-6, and not enough omega-3. Omega-6 are found in things like vegetable oils… which are in commercial baked goods, salad dressings, and planted based cooking oils. The ratio of omega-3 to omega-6 in your intake, should be about 1:1 – 1:3 and most people? …are about 20 times that amount on the omega-6 fatty acids ranging from 1:20 – 1:30!! those omega-3 fatty acids that we’re LACKING are the necessary food for our brain stimulation and skin revitalization. They slow down aging, improve fat metabolism, lubricate your joints and decreases inflammation! YES! We need more of that! So how do you get MORE omega-3 you ask? Some great additions to your diet are several types of fish including salmon, pecans, almonds ,walnuts, soy nuts, flaxseed (great for cooking! ), and deep green veggies. So… I eat a lot of salad, but I honestly DON’T love to eat a lot of fish, and neither does my family. Plus we have to pay attention to not eat too much depending on mercury levels to be eating it DAILY. (*Not to mention, we had a terrible event around some salmon so I don’t think the kids will eat it for … the rest of their years at home.) We do add flaxseed and wheat germ to a lot of the things we bake, but again – I just don’t consume THAT much over all. No way is it close to the 3500 mg required daily. GOOD NEWS… there are some great supplements available to us that are affordable and lower calorie with all of the benefits! If there is a natural alternative to healing something in your body, I’m all for it. Be educated and start somewhere! I’ve taken a prenatal for the past 12 years. It’s my basic multivitamin but targeted specifically for those who are pregnant and or nursing, containing the all important folic acid. I’m actually still nursing… so that is what I currently take for a multivitamin. Most women’s multivitamins will cover you containing Vitamin A, C, E, copper, magnesium, zinc, calcium, potassium, and iron. Taking a vitamin with food will help your body absorb it, the exception to that rule is iron supplements, so maybe pick one that has less iron, or take that separately at night before bed. So…I thought I was covered and doing well for myself with my vitamins… all seemed well… I guess I just didn’t know how much better I could feel! I’ll be honest, I saw a HUGE difference in my overall health after I added in the following supplements to help with hormonal health and adding in Omega-3! So… unless you’re eating a serving of salmon daily, listen up! First and foremost I take a plain fish oil supplement. Before you turn up your nose, and recall any bad experiencing you’ve had with fish oil in the past… Fish oil has come a long way. I get ours at Target in the HUGE bottle because both my husband and I take it daily. We get “Burp-less Fish Oil” from Nature Made, and keep it in the refrigerator (taking 1-2 every morning = 2400mg))… we’ve NEVER had a “fishy” burp from it. Fish oil is full of those Omega-3s we need and will help you not only with your brain/heart/joint function like I mentioned, but help ward off depression, AND keep fat off your belly!! (It also helps to keep your body a bit more regular) Sound good? It is! We also take a “Ginkgo Smart” soft-gel from Irwin Naturals which has some fish oil in it (878mg) and also Ginkgo for brain clarity. (I call it my natural energy booster without caffeine ). I ran out of this the first time, and honestly… within a week I thought I had lost my mind again! Ginkgo really does help! Then I take an “Omega Woman” supplement from Nordic Naturals that has some Omega-3s (just a little over 100mg), but mainly it’s Evening Primrose Oil (800mg), which aids in hormonal balance. 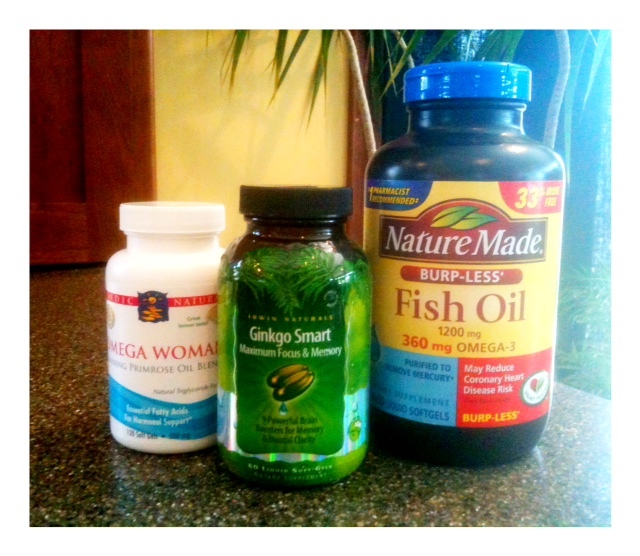 Danna Demetre recommends the Ultimate Omegas from Nordic Naturals, and then a Coromega. Finally, in effort to also help your family get healthy for Him – pay close attention to what types of multivitamins you’re giving your children. We were so saddened a few years ago when we realized they were putting aspartame in many children’s vitamins! There are many more options – look around! Posted on August 20, 2011, in Diet, Label Reading, Truth and tagged Danna Demetre, fish oil, gingko, healthy for God, healthy for him, losing weight, primrose oil, reasons to be healthy, Supplements, type II diabetes, working out, worship in body. Bookmark the permalink. Leave a comment.